Surprise a friend, loved one, or business client with a 1 1/2 lb. 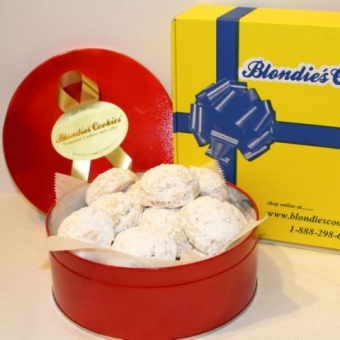 gift tin full of Blondie’s Gourmet Cookies. Each is individually wrapped for freshness. This is a gift everybody is sure to enjoy! To have corporate logos added to your tin call 1-888-298-6820.